Of the Eight Great Culinary Traditions of Chinese Cooking, Sichuan cuisine is arguably the most popular. Thanks to its liberal use of fiery chillies and Sichuan peppercorns, most people immediately characterise it by its unparalleled levels of spiciness, but there’s so much more to it than that. As an old local saying goes: “one dish, one flavour; one hundred dishes, one hundred flavours”. Although many of the most famous Sichuanese dishes are spicy, the cuisine itself is renowned for its numbing, sour, salty, tender, umami, and sweet flavours, which are typically intermingled to create a symphony of taste. In fact, Sichuan cuisine didn’t even acquire its most notorious ingredient, the red chilli, until about 400 years ago. According to historical records, during the Three Kingdoms Period (220-280 AD), the region roughly known as modern-day Sichuan province was famed for its sweet food. During the Jin Dynasty (265-420), pungent dishes that were rich in ginger, garlic, onions, mustard greens, and spring onions became more popular. It was only during the 16th century, when Portuguese sailors finally introduced chillies from South America into China, that Sichuan cuisine developed into the spicy sensation we know today. Since hot chillies are believed to open up the pores and drive out internal dampness, they became particularly popular in Sichuan province, which suffers from high humidity in summer and rainy or overcast weather throughout the year. The cuisine’s other signature ingredient, the Sichuan peppercorn, adds a unique lemony tang to each dish and creates a tingly, numbing sensation in the mouth. Unlike other famous regional cuisines, which were conventionally reserved for the upper class and wealthier members of society, Sichuan cuisine was eaten by nobles and peasants alike. So, if you want to truly live like the common people, be sure to try a few of these signature dishes! 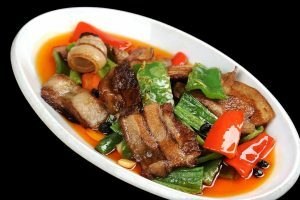 Twice-Cooked Pork is so-named because the dish’s main ingredient, the sumptuous pork belly, is simmered, left to rest, and then stir-fried. In short, this is a dish so nice they cooked it twice! In order to make it, the pork belly steak is first simmered whole in water with a mixture of spices, such as ginger, star anise, cloves, and salt. The meat is then refrigerated to firm it up before it is delicately cut into thin slices. These slices are stir-fried in a wok with a plethora of vegetables, such as white cabbage, bell peppers, onions, and spring onions, along with an aromatic sauce made from Shaoxing rice wine, soy sauce, ginger, sugar, and doubanjiang or broad bean chilli paste. 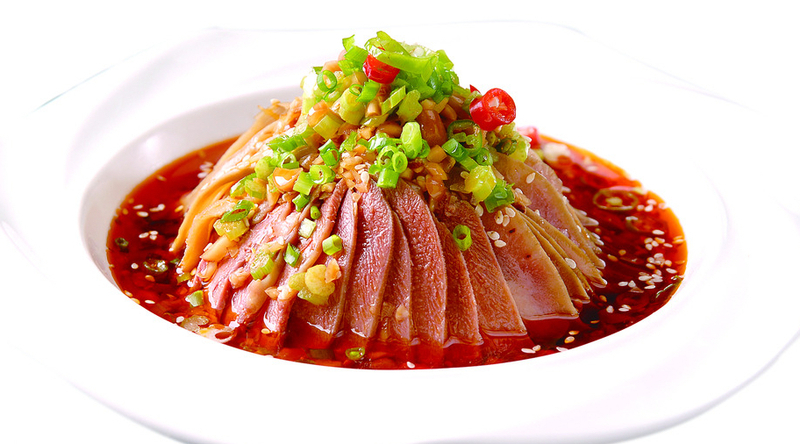 Much like Tea-Smoked Duck, this dish is mild rather than spicy and harkens back to Sichuan’s ancient past, as it was popular in the region as far back as the Qin Dynasty (221-206 BC). Nowadays this dish is a staple throughout homes in the province, and is rich with home-cooked flavours that offer an authentic taste of Sichuan. We’re heading out of the frying pan and into the fire with this notoriously spicy dish! 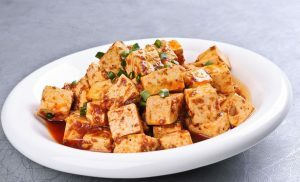 Mapo Tofu, which literally translates to mean “Pockmarked Granny Tofu”, is one of Sichuan’s hottest signature dishes and was supposedly so-named because it was created by a famously pockmarked old woman whose name has been tragically lost in the annals of time. Cubes of silken tofu are suspended in a bright red sauce made from red chillies, Sichuan peppercorns, chilli oil, garlic, Shaoxing rice wine, and broad bean chilli paste, along with pork mince, water chestnuts, onions, wood-ear mushrooms, and a variety of other vegetables. As one of the most popular and simplest dishes in the Sichuan canon, it is surprisingly easy to find both inside and outside of China. That being said, you’ll have to go to the source if you want to experience authentic, fiery Mapo Tofu. 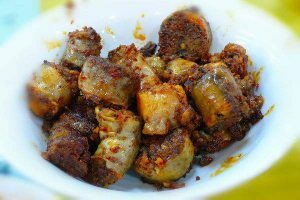 While it is undeniably spicy, it offers up a smorgasbord of flavours and has been described by chefs as numbing, fresh, tender, soft, aromatic, and even flaky. With so much going on, you’re sure to feel tongue-tied after trying this diverse dish! 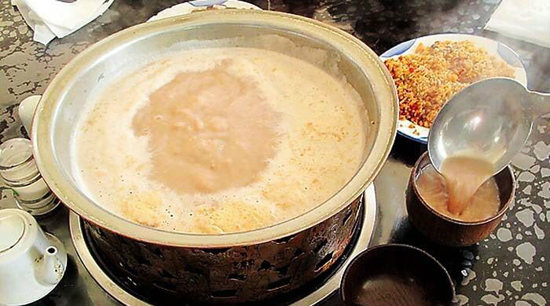 Shuizhu or “water-cooking” is a popular method employed in Sichuan cuisine, and is primarily used to retain the sumptuous moistness of meat. While Water-Cooked Beef is the more common dish, Water-Cooked Fish offers up slices of fresh white fish that absorb the multifarious flavours of the sauce and simply melt in the mouth. The flesh of the fish is first rubbed in starch and a little salt before being poached in water for about 30 seconds, just enough time to remove the rawness while still preserving the meat’s natural tenderness. 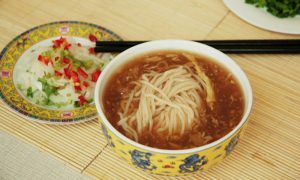 Once it has been poached, the meat is placed in a serving dish with a hearty helping of boiled vegetables, such as bean sprouts, white cabbage, and mushrooms. Dried chillies, Sichuan peppercorns, chopped garlic, and broad bean chilli paste are then sprinkled over the meat. Finally, vegetable oil is heated in a wok until it is nearly smoking before being poured over the meat and vegetables. The result is a veritable volcano of hot and tangy flavours, which are perfectly complemented by the soft texture of the fish. Before you start to think there’s something fishy going on, think again! The term yuxiang or “fish-fragrance” refers to a particularly kind of sauce that originates from Sichuan cuisine. The sauce itself doesn’t actually contain any seafood and doesn’t even really smell of fish. The name is instead derived from the fact that many of the seasonings in the sauce were based on ingredients traditionally used to cook fish. The famed sauce is made by sautéing a basic mixture of garlic, spring onions, and ginger, which is further enhanced by adding sugar, salt, doubanjiang or broad bean chilli paste, pickled red chillies, and soy sauce. These ingredients are fried in oil until they become fragrant. 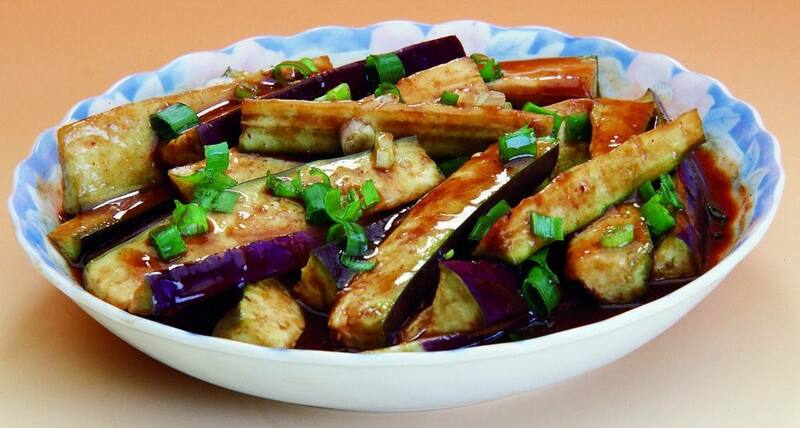 Water, starch, sugar, and vinegar are then added to thicken the sauce before it is ladled over chunky slices of braised eggplant. The soft texture of the eggplant means it absorbs the sauce beautifully, making for a mildly spicy dish that glances off the tongue. Walk down one of Shanghai’s celebrated snack streets and you’ll be met with a dizzying array of aromas, each one more tempting than the last. From sizzling skewers of tender beef to steaming containers rich with plump dumplings, you’ll be sure to find a treat to suit anyone’s palate. Shanghai cuisine is characterised by its emphasis on three elements: colour, aroma, and taste. Popular ingredients include fresh fish, shellfish, chicken, pork, soy sauce, sugar, and various vegetables. Over time, this has resulted in a myriad of snacks that are light, fresh, and bursting with the natural flavour of their ingredients! Of all the local delicacies in Shanghai, this is undoubtedly the most well-known. 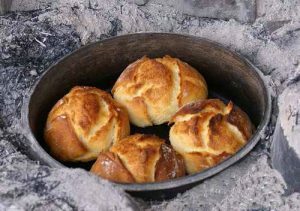 With over one hundred years of history behind it, local vendors have had plenty of time to perfect this sumptuous snack! Xiaolongbao, also known as Shanghai dumplings, are a type of steamed bun made with a thin skin of dough. They are commonly stuffed with pork, although some variations use minced crab meat and crab roe. Xiaolongbao are wrapped and sealed differently to other types of dumpling, and this is because of their one unique ingredient. Each tiny parcel is filled to the brim with a delicious broth! 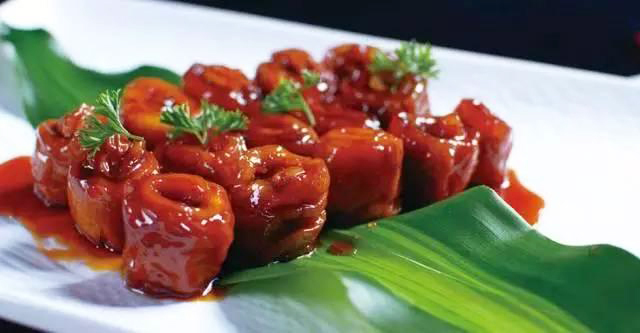 This is usually made by mixing Shaoxing rice wine with pork jelly, which melts as the dumplings are cooked. That being said, each vendor has their own secret recipe for their signature soup! Although the wrappers may seem delicate, a well-made xiaolongbao will hold in the soup even when it is lifted up with a pair of chopsticks. A batch of these tasty treats are typically steamed in a bamboo basket before being served with a sauce made from black vinegar and, in some places, shredded ginger. Remember, these aren’t just your average dumplings, and you’ll want to eat them in the correct way to avoid a scalded tongue! The best way to eat xiaolongbao is to place it on a spoon, bite off the top, drink the soup, then dip the remaining dumpling in the vinegar sauce before eating it. 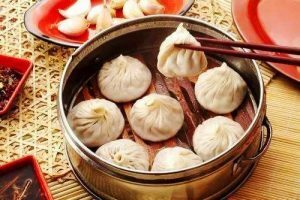 The most well-known type of xiaolongbao, known as Nanxiang Xiaolongbao, is usually stuffed with pork, pork jelly, ground sesame seeds, shredded bamboo, and shrimp. It comes from Nanxiang Township in Shanghai’s suburbs, although it can be found throughout the city. Shengjianbao or Pan-Fried Pork Buns are Xiaolongbao’s chubby cousins. They’re bigger, bolder, and bursting with flavour! Like Xiaolongbao, Shengjianbao have been a popular local snack in the region for over a hundred years. 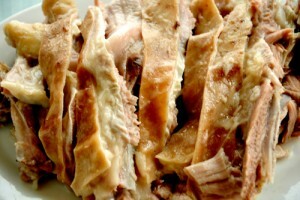 They are made by wrapping fresh pork and pork jelly in a dough made from half-risen flour. This dough is made using yeast, meaning it’s a little thicker than your average dumpling skin, and the topknot is tucked underneath rather than sitting on top. The buns are pan-fried, with cold water being periodically added to the pan. A lid is used to cover the buns and keep in the steam. This results in the bottoms of the dumplings being fried, while the tops are steamed. Right before they are fully cooked, a smattering of chopped spring onions and sesame seeds are sprinkled on top of the buns. 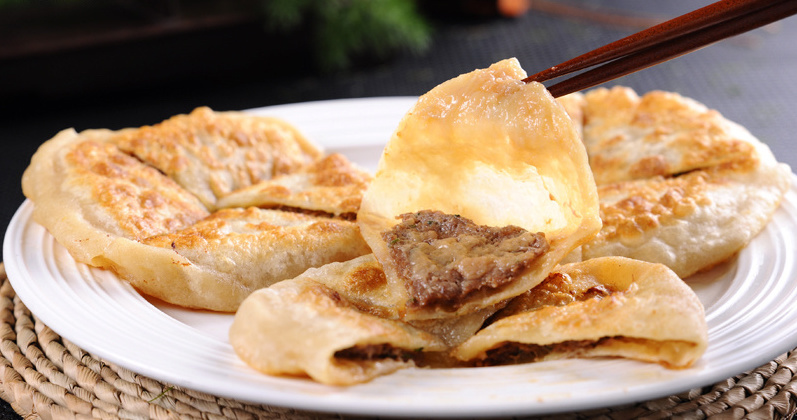 The perfect Shengjianbao has a thin skin, a fragrant filling, and a crispy golden base. Many restaurants throughout Shanghai serve variations on this simple treat, including ones filled with chicken and crab meat. 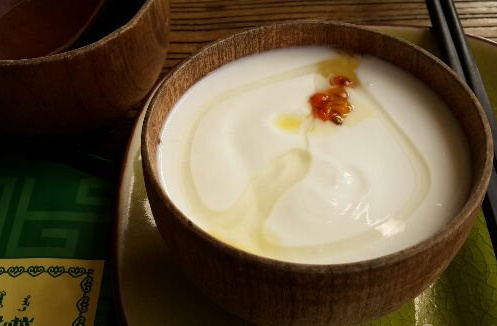 Known as one of the “Four Heavenly Kings”, Cifantuan is one of the four most popular breakfast foods in China. It originates from Shanghai and is made by wrapping a piece of fried dough, known as youtiao, in glutinous rice. It comes in two varieties: sweet and savoury. 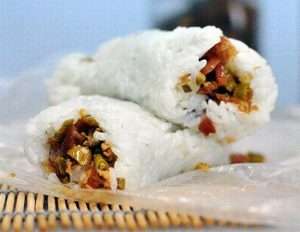 Sweet Cifantuan is made by simply adding sugar and sometimes sesame paste to the filling, while the savoury version includes ingredients such as pickled vegetables, salted duck eggs, and shredded pork floss. They are particularly popular in Taiwan, Hong Kong, and eastern China, where they’re eaten with sweet or savoury soy milk as part of a balanced breakfast. Modern variations on the traditional Cifantuan have been adapted in Taiwan and Hong Kong before being re-introduced to Shanghai. Don’t let the name fool you, Crab Shell Cake is named for its colour, not its content! The name derives from the snack’s distinctively yellowy brown hue, which is said to resemble that of a cooked crab shell. The outer casing is a type of shortbread made from flour, oil, and sesame seeds, which is stuffed with sweet or savoury fillings. 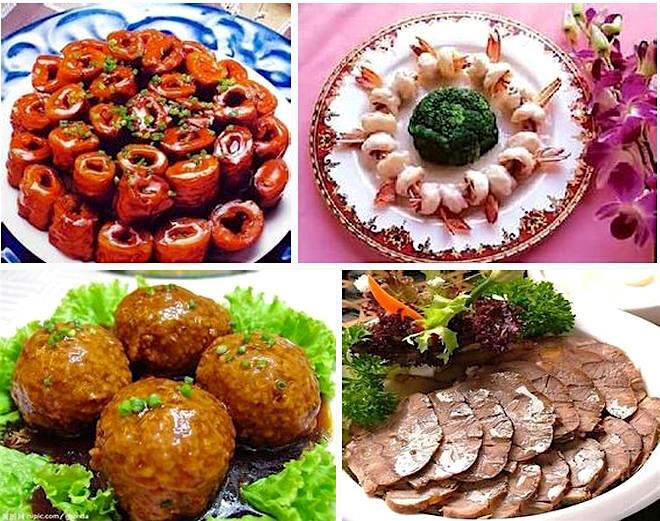 While some variations of Crab Shell Cake do contain crab meat, other popular ingredients include pork, shrimp, sugar, rose petal paste, sweet red bean paste, and jujube paste. The cake’s delightfully crispy exterior is complemented perfectly by the smooth texture of its filling. According to the Chinese lunar calendar, the tenth month is referred to as “Little Yangchun”, and it is a local Shanghai-ese custom to use “yangchun” as an alternative term for the number “ten”. 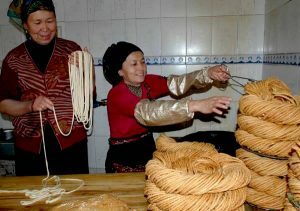 When these noodles first became popular in the area, they only cost a meagre 10 fen, so the local people naturally began called them Yangchun Noodles. Like an embarrassing nickname, this title seems to have stuck! 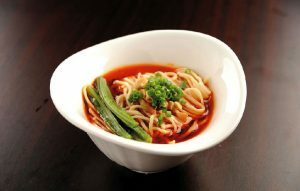 These noodles are served simply in a clear soup, usually with a dash of scented scallion oil to give them an added kick. Fen: A unit of currency that is used throughout China. One fen is equal to one-hundredth of a yuan or one-tenth of a Chinese jiao. While you may not have directly heard of Shandong-style cuisine, chances are you will have felt its influence. As one of the oldest styles in northern China, it has had a direct and palpable impact on other well-known styles of Chinese cuisine, such as that of Beijing and Tianjin. It is held in such high regard that it is not only considered one of the Eight Great Culinary Traditions of Chinese Cooking, but is regularly shortlisted as one of the top four. Its venerable history dates all the way back to the Spring and Autumn Period (c. 771-476 BC), when Shandong as a province had yet to exist and the region was split into two vassal states: the State of Qi and the State of Lu. The style is often referred to as Lu Cuisine, since the State of Lu was home to Shandong province’s most revered citizen, the great philosopher Confucius. Although Confucius is most renowned for his teachings on morality and education, he wasn’t above philosophising about food! In his Analects, he states: “Do not consume food which looks spoiled, smells spoiled, is out of season, is improperly butchered, or is not made with proper seasoning”. This may seem like common sense now, but over 2,000 years ago food hygiene was still a mystery to the citizens of Lu! 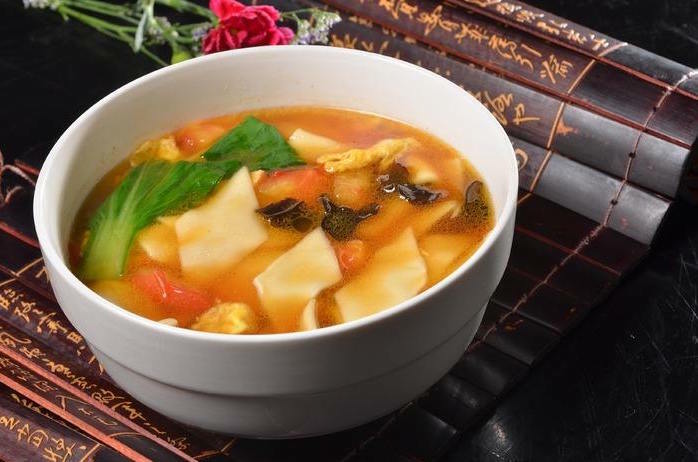 His statements indicate that, all those years ago, the people of Shandong province had already achieved a certain level of refinement with regards to food preparation. 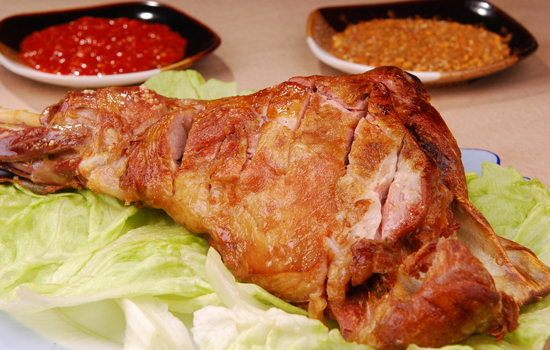 However, much of modern-day Shandong cuisine was developed from the Yuan Dynasty (1271-1368) onwards. The style can be roughly split into three sub-styles: the seafood heavy Jiaodong-style along the Jiaodong Peninsula; the soup-centred dishes of the inland Jinan-style; and the elaborate banquets of Confucius’ Mansion cuisine. While these sub-styles tend to differ in their preferred ingredients, they share many similar characteristics when it comes to preparation and flavour. Liberal use of seasonings such as onions, spring onions, and garlic endow many signature dishes with their distinctive pungency, while a serious dose of salt and soy sauce add a smack of saltiness. Yet Shandong’s star seasoning will always be its vinegar, which is made using centuries-old recipes and traditional local methods. It is much darker and more complex than other types of Chinese vinegar, and is so beloved by the locals that some of them even drink it on its own! 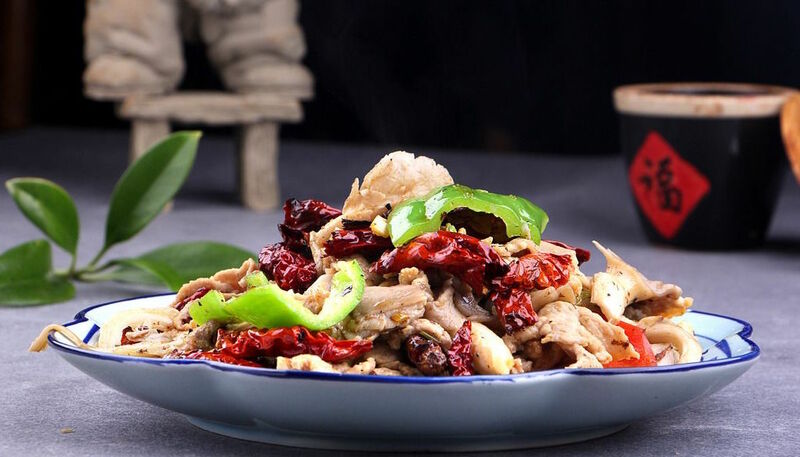 These seasonings may sound a little overbearing, but the main aim of Shandong cuisine is to capture the natural colour, taste, and essence of the main ingredients. To this end, over 30 different cooking methods are deftly used in order to maximise the potential of each ingredient. 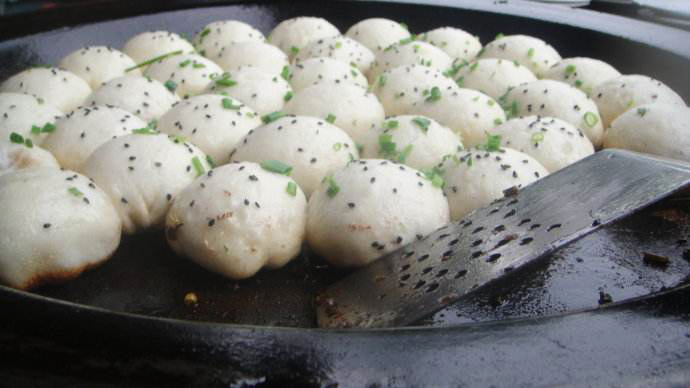 The most popular cooking methods are known respectively as “bao” and “zha”. 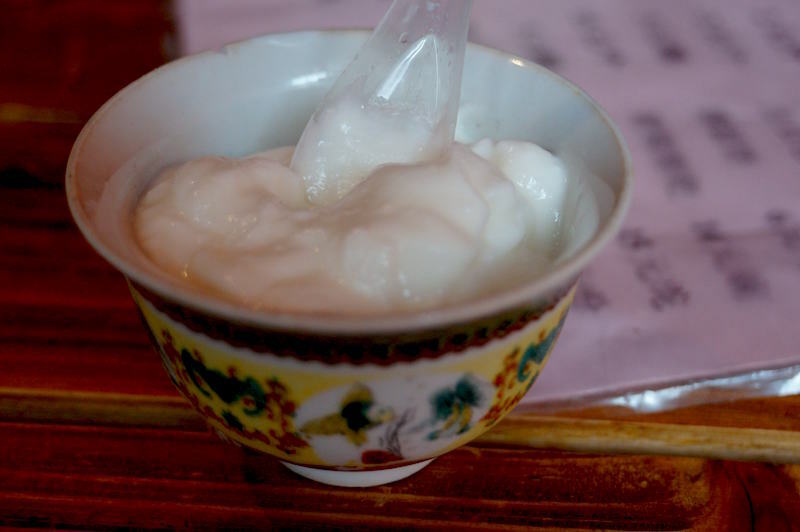 The “bao” technique involves allowing oil to boil at an extremely high temperature before tossing the ingredients into the wok and quickly stir-frying them. The heat of the oil means that the ingredients are slightly singed, but their natural flavour is locked in. Once the ingredients are fully cooked, the oil is removed and seasonings are added, although sometimes the oil will be incorporated into the dish’s sauce. The “zha” technique, on the other hand, is another frying method where meat is covered in flour and then stir-fried to make it wonderfully crisp on the outside but tender and flavourful on the inside. 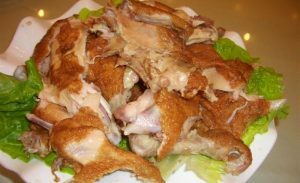 Dezhou Stewed Chicken is essentially exactly what it says on the tin! It originates from the city of Dezhou, its primary cooking method is stewing, and its main ingredient is a plump chicken. 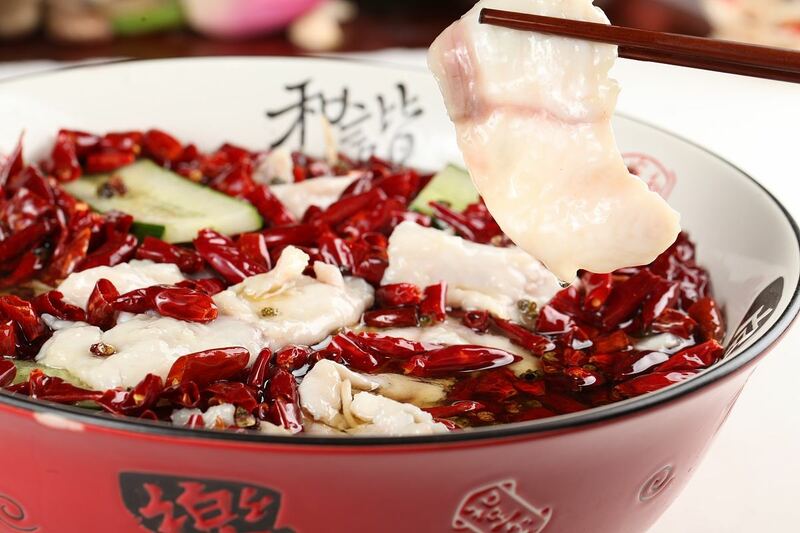 Its traditional name of “Dezhou Five-Fragrant Boneless Stewed Chicken” is far more misleading as it’s not boneless and, while it does indeed smell appetising, saying it boasts five fragrances might be a bit ambitious! 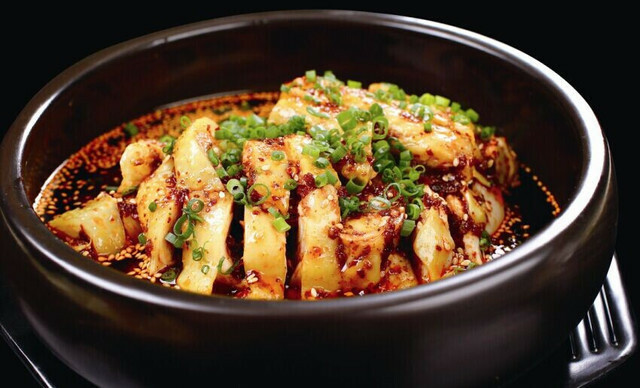 According to local rumour, the dish was developed by the Deshunzhai Restaurant during the Qing Dynasty (1644-1912). By the 1950s, it was so popular that it was even served to Chairman Mao himself. The dish involves first rubbing caramelised sugar all over a chicken and deep-frying it until its skin turns a crisp golden brown. The chicken is then stewed in an aromatic soup made from soy sauce, Sichuan peppercorns, ginger, cinnamon, aniseed, nutmeg, cloves, fennel, soy sauce, angelica root, black cardamom, dried orange peel, and galangal. Since this dish can take upwards of eight hours to make, it is usually only served in specialist restaurants. While the chicken retains its original shape, it’s so perfectly cooked that the tender meat practically melts off of the bone. 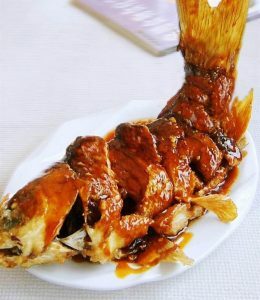 Sweet and Sour Yellow River Carp, which is unsurprisingly made of grass carp fished from the Yellow River, is arguably one of the most iconic dishes in the Shandong canon. It is said that carp from the Yellow River taste different from any other river fish in the country, and it’s been a popular delicacy at imperial banquets for hundreds of years. This particular dish is well-known for its unusual presentation, as the fried fish is served with its tail curved up in the air. This is to give the illusion that the fish has been caught jumping out of the water! To make Sweet and Sour Yellow River Carp, incisions are made along a whole carp to ensure that the skin remains crispy and the flesh stays moist when it is breaded and deep-fried. Before it is fried, the fish is seasoned with pepper, salt, and soy sauce to give it a pleasant tang. Meanwhile, the sweet and sour sauce is made by mixing vinegar and sugar with ginger, spring onions, Shaoxing rice wine, and soy sauce. The fish is fried first and then removed from the pan when its scales have turned a rich golden brown. The sauce is then added to the pan and cooked at a medium heat for approximately one minute before the fish is re-added and stirred to thoroughly coat it in the sauce. The sweet, tangy sauce complements the soft and subtly flavoured flesh of the fish beautifully, resulting in a dish that is both light and flavourful. When it comes to Chinese cuisine, you should never judge a dish by its name! 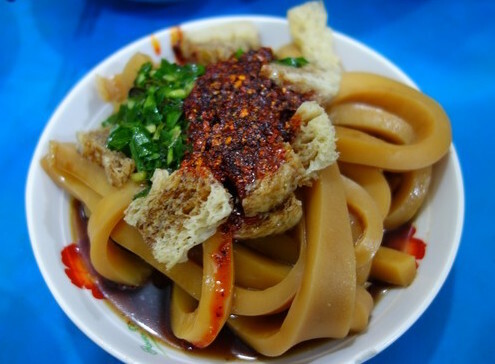 Although Nine Procedure Large Intestines may not sound like the most appetising of meals, it has been a wildly popular staple in Shandong province since the Qing Dynasty. A long strip of pig’s intestines is first cleaned, prepared, and boiled so as to remove the unwanted odour of offal. Once they are soft and tender, the intestines are removed from the boiling water and cut into small sections before being deep-fried until they are deliciously crispy. The dish’s sauce is made by frying a mixture of onion, garlic, and ginger in a wok until it becomes aromatic. From there, chicken broth, soy sauce, salt, sugar, Shaoxing rice wine, and vinegar are added to give the sauce depth. Finally, the pork intestines are stir-fried in the sauce and garnished with coriander to serve. The name “Nine Procedure Large Intestines” has absolutely nothing to do with the cooking method, and in fact refers to the Nine Procedures in Taoism used to refine the pills of immortality. In other words, scholars considered this dish so difficult to perfect that they likened it to man’s never-ending quest to achieve eternal life! As a coastal province, seafood plays a major role in Shandong cuisine. Braised Sea Cucumber is one of the classic dishes in the Shandong canon and is emblematic of the locals’ love for seafood. Although the sea cucumbers are phenomenally fresh and have a rich umami flavour, the real power behind this sumptuous dish comes from the sauce. This sauce is made simply by caramelising a mixture of chopped onions, spring onions, and soy sauce in oil and sugar. Meanwhile, the sea cucumber is gently braised in chicken stock, salt, and Shaoxing rice wine. Once the sauce is prepared and the sea cucumber is thoroughly cooked, the two are mixed in a pan along with a hearty helping of ginger and brought to a boil before starch is added to thicken the sauce. 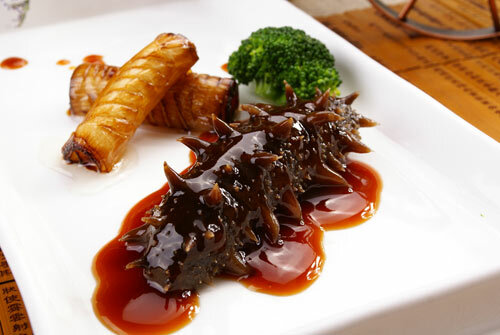 While this dish can look a little unusual and somewhat unappetising, the smooth texture of the sea cucumber is perfectly complemented by the sour tang of the sauce, offering up a taste sensation that is sure to confuse and delight your taste-buds in equal measure. Abalone is another aquatic favourite in Shandong province that we rarely see in Western cuisine. In this signature dish, the abalone is served with its shell to give diners the impression that they’re sampling a little bit of the ocean. 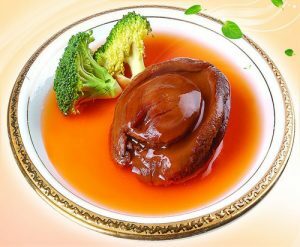 The abalone itself is relatively bland, but absorbs the light sauce beautifully and provides a wonderfully chewy texture. 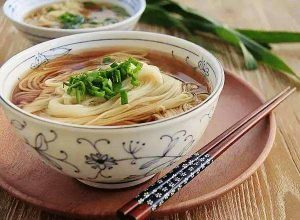 In order to make the sauce, an aromatic mixture of Shaoxing rice wine, rice vinegar, sugar, salt, ginger, garlic, spring onions, chicken stock, and starch is brought to a boil and then quickly removed from the heat. The juicy slices of abalone are fried in hot oil with chopped chilli peppers for approximately two minutes, until the abalone is fully cooked. The oil is then removed from the pan and the abalone is re-added along with the sauce, which is swiftly brought to a boil. Once the dish is piping hot, it’s taken off the heat and served immediately. The light sauce virtually glances off of the tongue, while the thick slices of abalone provide you with something to really sink your teeth into! As one of the Eight Great Culinary Traditions of Chinese Cooking, it should come as no surprise that Shandong province offers a plethora of snacks that are as unique as they are delicious. Shandong cuisine is renowned for its liberal use of pungent ingredients such as garlic, onion, and spring onions, its saltiness, its crispy textures, and its locally produced vinegar, which is much darker and more complex than other Chinese vinegars. Seafood is a popular ingredient in this coastal province, but Shandong chefs are so skilled that they are able to bring out the natural flavour and essence of whatever they cook, from delicate river fish to simple vegetables. In short, you’ll never be too far away from a satisfying snack in this province! When it comes to Chinese cuisine, dumplings are always a fan favourite. Sumptuously soft dumpling skins, moist morsels of pork mince, mouth-wateringly aromatic dipping sauce; what’s not to love? Shandong-style dumplings utilise a dumpling skin fashioned from a simple mixture of rice flour and water, with a hearty filling made from pork mince, dried shrimp, soy sauce, salt, Shaoxing rice wine, sesame oil, shredded ginger, and chopped spring onions. 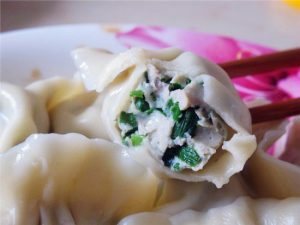 In the coastal Jiaodong region, a special version of these dumplings is made using a species of fish known as a Spanish mackerel as its main ingredient. A liberal dollop of filling is ladled into each dumpling skin before they are sealed and placed in a large pot of boiling water. Cold water must be periodically added to the pot and stirred in order to make sure none of the dumplings burst. When the dumplings are thoroughly cooked, they are delicately scooped out of the water and served with a fragrant dipping sauce made from soy sauce, rice vinegar, sesame oil, and chilli paste. Each dumpling is packed full of flavour, and the dipping sauce adds a pleasantly sour tang that glances off of the tongue. While many of us associate meatballs with Italy, you’ll be surprised to hear that they actually originated from Shandong province! 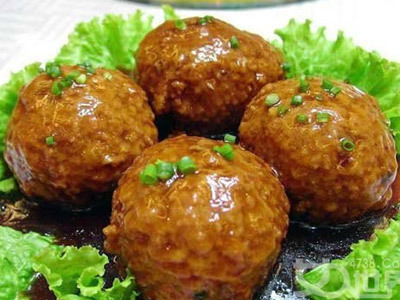 The recipe for Four-Joy Meatballs is one of the oldest in the world, dating all the way back to the Qin Dynasty (221-206 BC). Very few dishes can match its pedigree, and still fewer can compete with its simple but hearty flavour. The meatballs are rolled from a mixture of pork mince, diced onions, ginger, lotus root, Shaoxing rice wine, pepper, soy sauce, eggs, and starch. They are then fried before being steamed with more soy sauce and Shaoxing rice wine until they are perfectly cooked. The result is a bite-sized snack that is crispy on the outside but irresistibly moist on the inside. The crunchy texture of the lotus root is complemented by the softness of the pork mince, while the umami flavours of the meat intermingle beautifully with the aromatic ginger. The round shape of the meatballs is said to symbolise gathering and union in Chinese culture, and the meatballs are always served in fours to signify the Four Joys of Life traditionally marked by family gatherings: Courtship, Marriage, Child-Rearing, and Aging. Penglai Noodles are a famous traditional snack hailing from the coastal city of Penglai. The noodles are made and stretched by hand in order to ensure that they’re thin but retain their toughness and durability. According to the locals, these noodles are so thin that they simply melt in your mouth without you having to chew. So, if you’re feeling particularly lazy, this might be just the snack for you! The noodles are first boiled before being served in a light broth made from red snapper. They are often eaten for breakfast, because there’s nothing quite like a steamy bowl of noodle soup to ward off the brisk sea breeze. It should come as no surprise that, while it does feature Chinese and Russian influences, Inner Mongolian cuisine is profoundly similar to that of its neighbouring cousin: Mongolia. This cooking style has been shaped primarily by the resident Mongol ethnic minority, who have adapted their signature dishes not only to reflect their culinary preferences but also to accommodate their lifestyle. The Mongolian people and many of the other ethnic minorities who populate Inner Mongolia are predominantly nomadic and pastoral. Historically, their diet has adapted to help them survive during the bitterly cold winters. The extreme climate meant that spices and vegetables were not readily available, so they rarely feature in signature Mongolian dishes. Thus they have had to rely upon what they call “red foods” (fatty meats), “white foods” (dairy products), and wheat-based foods. Staple ingredients such as mutton, beef, milk, cheese, butter, buckwheat, oatmeal, and millet could all be easily produced in the hostile steppes and provided hearty fare for the nomads throughout the year. 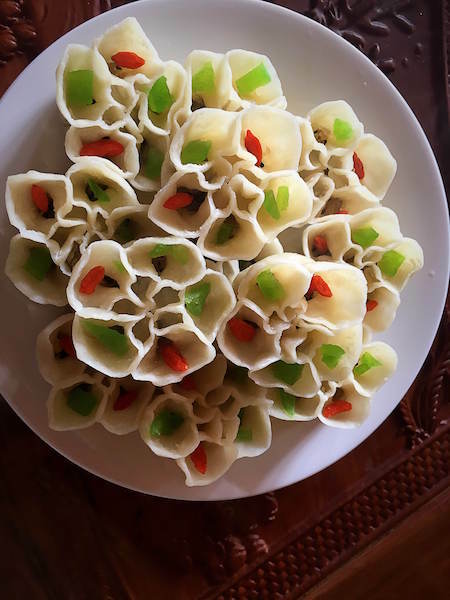 Nowadays the influx of Han Chinese immigrants has meant that Inner Mongolian locals have increased access to fresh fruits and vegetables, but their traditional cuisine lives on in the form of their delicious snacks. 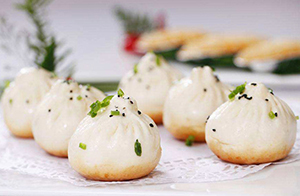 These delectable little dumplings may seem like an icon of Chinese cuisine, but they actually originated from Inner Mongolia’s capital of Hohhot! Shumai appeared in the region sometime between the Ming (1368-1644) and Qing (1644-1912) dynasties, and were usually served in teahouses as a side dish. It was thought that merchants traveling from Shanxi province introduced them to Beijing and Tianjin, which caused them to gradually become more widespread in China. They were originally called “shaomai” (捎卖), which literally means “sold on the side” and derives from the fact that they were often served as a tasty accompaniment to tea. While the pronunciation has been maintained, the Chinese characters for writing it have changed over the years. 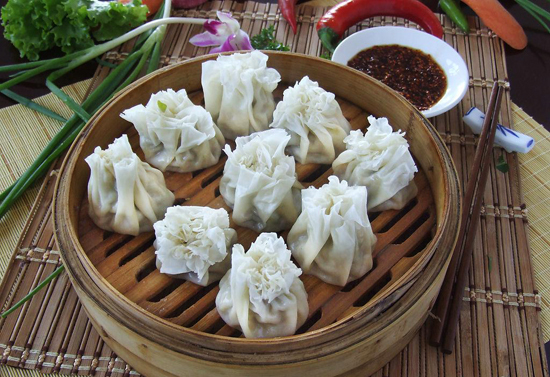 Hohhot Shumai are usually served in small, specialty shaomai restaurants and are conventionally eaten at breakfast. The dumpling wrappers used are typically thin and, like other types of dumpling wrapper, are made simply from flour and water. These little parcels are then stuffed full of a delicious filling made from minced lamb, spring onions, and ginger. This gives them a dense flavour with a slightly spicy tang. 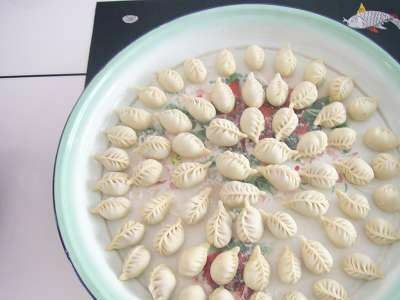 The pastry is then loosely gathered around the filling to form the characteristic “flower” shape at the top of the dumpling. Depending on personal preference, Hohhot Shumai can either be steamed or pan-fried and are conventionally dished up in servings of eight. A small bowl of Shanxi black vinegar for dipping and a cup of tea are the perfect complement to these sumptuous little snacks. 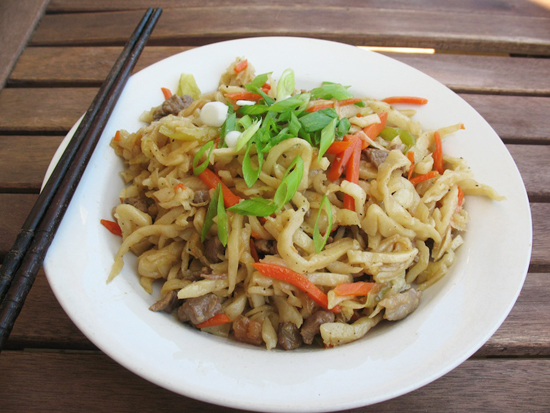 Tsuivan is a traditional Mongolian dish made from noodles, mutton, and a variety of hearty vegetables. The noodles are prepared by hand using dough made from wheat flour, buckwheat flour, or oat flavour depending on what is available. Unlike Chinese noodles, which are generally uniform in shape, this dough is roughly cut into thick strips. These noodles are then sautéed in a pan along with bite-sized pieces of mutton, potato, carrot, a sprinkling of salt, and some water. The result is a robust, stew-like dish that is sure to warm you up during those frosty Mongolian winters! When guests are welcomed into a Mongolian herdsman’s yurt, they are usually offered a traditional beverage known as Suutei Tsai or Milk Tea. After all, who doesn’t love a good cuppa! The type of tea used is either black or green and is referred to as “block tea” or “brick tea” because it comes from a compressed block made from lower quality tea, such as tea stems or inferior tea leaves. This makes the tea easier to store and means it will last for longer. When needed, tea is chipped off of the block and added to boiling water. Once the water has changed colour, milk is added along with a teaspoon of salt. The milk is typically very fresh and is usually that of a cow, although milk from camels, horses, yaks, goats, and sheep may also be used depending on availability. Some recipes also include butter, fat, and even fried millet. Talk about overegging the pudding, or should we say over-seasoning the tea! Historians believe that the tradition of drinking milk tea arose from a belief within the Mongol ethnic group that water was sacred and therefore should not be drank straight. Nowadays it’s often drunk at meals as a palate cleanser, since food in Inner Mongolia is notoriously fatty. Although its distinctive saltiness may come as quite a shock to foreign tongues, it’s a must-try if you want a taste of authentic Mongolian culture. Following the dairy theme, airag is an alcoholic beverage made from the milk of a horse! 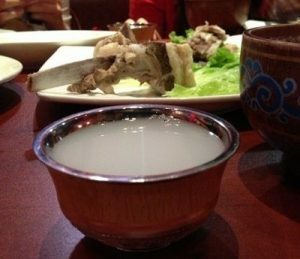 Airag is actually its Mongolian name, and it’s more often referred to as kumis. It is particularly popular among several of China’s nomadic ethnic minorities, including the Kazakhs, Kyrgyz, and Mongols. That being said, milking a mare is no mean feat! Because of the difficulty involved in acquiring mare’s milk, it is a limited commodity, and so airag produced on an industrial-scale is normally made from cow’s milk. Since cow’s milk has lower sugar levels than mare’s milk, when it ferments it has a much lower alcohol content. So if you’re looking to get a buzz on in Inner Mongolia, be sure to get the real deal. Although steer clear of unfermented mare’s milk, as it’s supposedly a potent laxative! Unlike beer or wine, where the alcohol content is derived from fermented grains and fruits respectively, the alcohol content in airag comes directly from the fermentation of natural sugars in the mare’s milk. Raw, unpasteurized mare’s milk is left to ferment over the course of hours or even days, while being stirred or churned on a regular basis. Traditionally this would take place in a horse-hide container, which would either be placed on top of a yurt and turned over periodically, or attached to a saddle and shaken up during the course of a day’s riding. In some historical accounts, it was even said that this container would be hung at the door of the family’s yurt and that locals would punch the container as they walked passed, thus agitating the contents and helping the milk to ferment rather than coagulate and spoil. Who would have thought that you’d ever welcome a punch from your neighbour! The finished product is typically served chilled and has a slightly sour flavour, with an alcohol content of between 0.7 and 2.5%. According to historical documents, it has been brewed in Central Asia since the 5th century BC and, during the 19th century, it even achieved a reputation as a cure-all. Historical figures like Leo Tolstoy and Anton Chekhov flocked to “Kumis Resorts” in an attempt to cure themselves of their various ailments. So if you catch a cold during your hike across the Inner Mongolian grasslands, be sure to have a swig of this unusual liquor! Unsurprisingly, the cuisine in Inner Mongolia has been heavily influenced by the Mongol ethnic minority, who make up a substantial proportion of the region’s population. 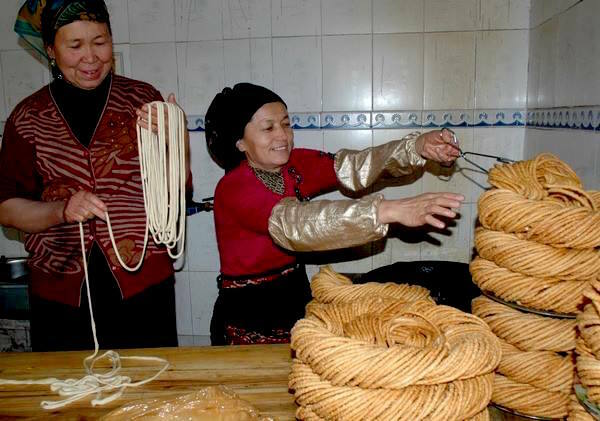 Since Inner Mongolia shares its borders with Outer Mongolia and Russia, its cuisine has also incorporated features from traditional Mongolian, Chinese, and Russian cuisine. You could almost say it’s a real melting pot of cultures! Since the Mongolian people who inhabited the grasslands were conventionally nomadic and pastoral, they had to find a diet that would help them survive during the bitterly cold winters. Thus their cuisine places great emphasis on three categories of ingredients: “red food” (fatty meats), “white food” (dairy products), and wheat-based foods. The extreme climate meant that spices and vegetables were not readily available, so they rarely feature in signature Mongolian dishes. Traditionally only a few native plants, such as wild spring onions and wild thyme, and hardy plants that grew on the steppes, such as buckwheat and millet, would be used in dishes, although nowadays the influx of Han Chinese immigrants means that other ingredients have been introduced to the Inner Mongolian palate. Mongolian nomads typically farmed what they referred to as the “Five Snouts”: sheep, goats, yak, camels, and horses. Nowadays they also farm cattle, but cattle and goats are prized for their milk while horses, camels, and yak are considered valuable pack animals. This left the poor sheep with the task of providing most of the meat, which explains the marked preference for mutton in many Mongolian dishes. Mutton from sheep raised on the grasslands is rumoured to be the best in China, as the sheep enjoy a diet of fresh grass and mineral water instead of man-made feed. Historically this hearty meat helped the local people to keep weight on during the winter, along with other “heavy” foodstuffs such as milk, cream, milk tea, butter, cheese, buckwheat noodles, and oat flour pancakes. So be prepared to pack on the pounds during your tour of the grasslands! In the past, this sumptuously meaty dish was a privilege reserved only for Mongolian royalty, since it was both expensive and complicated to cook. Nowadays, it is readily available throughout the restaurants and grasslands of Inner Mongolia. The main ingredient is unsurprisingly a whole sheep, which is filled with a mixture of spices before being baked in an airtight oven at high temperature for four to five hours. Once the meat is medium to well-done, the carcass is removed from the oven and roasted over an open fire until it has turned a crispy golden-brown. 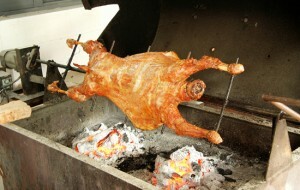 The firewood used is typically from the apricot tree, as the smoke produced helps give the mutton its distinctive taste. After being roasted to perfection, the dish is served whole on a huge wooden platter. Custom dictates that, while the meat is being carved, a small triangular slice from the sheep’s head should be thrown in the fire as an offering. The two different cooking methods result in the mutton being mouth-wateringly crispy and flavourful, with meat so tender that it literally melts in your mouth. 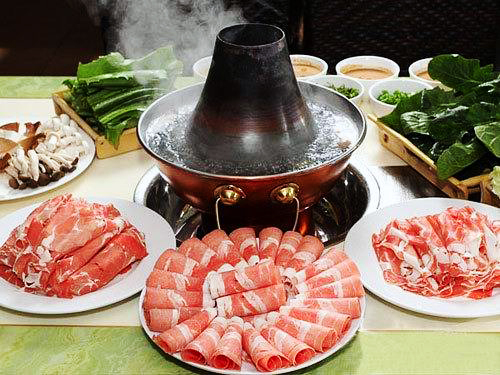 Hot Pot may seem like an iconic Chinese dish, but it actually originated from Mongolia! Sometime during the Jin Dynasty (265-420), it became a popular way of eating meat such as beef, mutton, and horse among Mongolian herdsmen living on the northern grasslands, but it didn’t spread to southern China until the Song Dynasty (960-1279). While several regional variations developed throughout China, the Mongolian Hot Pot or “Instant-Boiled Mutton” remained the favourite of the Yuan Dynasty (1271-1368) and is a popular dish in Inner Mongolia to this day. According to local legend, the dish originated when Kublai Khan, the Khagan of the Mongol Empire and founding Emperor of the Yuan Dynasty, developed a sudden craving for stewed mutton. However, he happened to be in the middle of a battle and the enemy’s troops were fast approaching! In order to satiate his hunger, a chef deftly cut off a dozen thinly-sliced mutton strips and placed them in boiling water. As soon as the meat had browned, he swiftly removed it and put it in a bowl with a little salt. Kublai Khan devoured these mutton strips with glee before heading off to battle and achieving a grand victory. At the subsequent celebratory banquet, he requested that the chef prepare this mutton dish again and its status as a regional delicacy was cemented. The dish consists of the choicest slices of mutton, cut from the back, rear legs, and tail of the sheep. Typically this raw mutton is served alongside tofu, Chinese cabbage, bean sprouts, and vermicelli. A pot of boiling soup is laid on a hot plate in the middle of the table, in which the raw ingredients are placed and left to cook. It is imperative that the mutton is removed as soon as it has browned. Each person is typically given a bowl containing a dipping sauce, which is made from sesame oil, chilli oil, spring onions, and soy sauce. Guests are then free to pick strips of the juicy mutton from the soup with their chopsticks and season them to taste. This traditional dish has been a favourite among Mongolian herdsmen for thousands of years, in part because it’s so deliciously simple! Meat from a freshly butchered sheep is first carved and then placed into a wok of boiling water with a little salt but no other seasonings. The mutton is thoroughly cooked but never allowed to over-boil, as this would make the meat tough and unpalatable. Once the mutton has browned nicely, it is removed from the water and should be eaten before it cools. The name “grabbing mutton” derives from the fact that traditionally the mutton is eaten with the hands, kind of like barbecued spare ribs. If a local has treated you to this hearty dish, you must allow the host to select your piece of mutton for you, as customarily different parts are served to different guests. For example, the elderly are usually offered cuts from the leg and younger people will be given the ribs, while women get to enjoy the tender meat from the chest. By now, you’ve probably noticed a pattern in the signature dishes of Inner Mongolia. We weren’t kidding when we said they loved mutton! 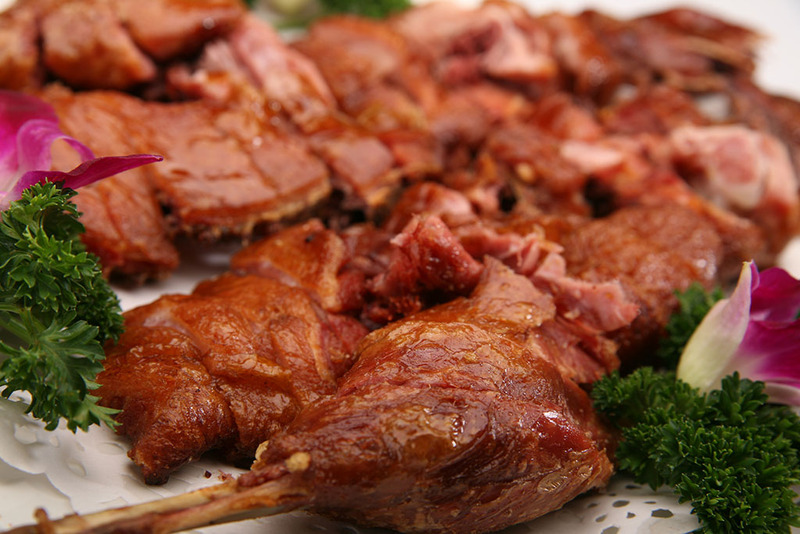 Roast Leg of Mutton was supposedly a favourite of the infamous warlord Genghis Khan and is cooked in much the same way as Whole Roasted Sheep. A sheep’s leg is first scored across the skin before being seasoned with salt and placed on a tray with shredded carrot, celery, shallots, ginger, tomatoes, and peppers. The leg is then roasted in an oven for approximately 4 hours, until the skin has turned a rich golden-brown and the meat gives off an irresistible aroma. Nowadays this dish is a popular alternative to Whole Roasted Sheep, as it takes less time to cook and the leg is considered the tastiest part of the animal. Since Jiangsu or “Su” cuisine is often praised as one of the Eight Culinary Traditions of Chinese Cooking, it goes without saying that the snacks on offer in this province are plentiful and delicious! This style of cooking places emphasis on presentation and the natural essence of ingredients, resulting in dishes that are visually stunning and richly flavourful without being overly seasoned. Soups play a starring role in most snack dishes and are highly acclaimed for being light and fresh, rather than oily or greasy. With palate-cleansers that are this scrumptious, you might even forget about the main course! 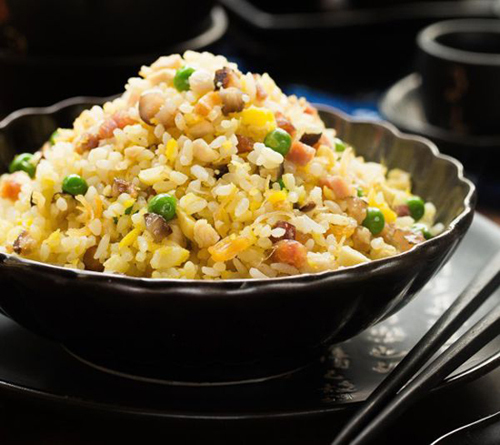 Also known as Yangzhou Egg Fried Rice, this staple dish hails from the city of Yangzhou and is one of the most immediately recognisable dishes in Jiangsu, since it’s served in Chinese restaurants throughout the world. The ingredients of this hearty dish vary from restaurant to restaurant, but some of the staple items include: cooked rice that is preferably a day old, since freshly cooked rice is often too sticky; cooked shrimp; diced char siu or Chinese barbecue pork; chopped spring onions; eggs; and fresh vegetables such as peas, Chinese broccoli, carrots, and corn. Like glittering jewels in a fine brooch, these multi-coloured ingredients add a touch of vibrancy to the dish. According to local legend, the dish was brought to the region during the Sui Dynasty (581-618) by a powerful imperial minister named Yang Su. Fried rice was one of his favourite foods and, when he was escorting Emperor Yangdi through the district of Jiangdu, he introduced his recipe to the people of Yangzhou. There are two ways of cooking this sumptuous dish based on when and how the egg is scrambled. The first, known as “silver covering gold”, is when the egg is scrambled separately and then mixed in with the rice. The second, known as “gold covering silver”, is when the liquid egg is poured over the rice and vegetables as they are being stir-fried. It’s rumoured that the finest chefs in Yangzhou can cook the dish with a rice grain to egg piece ratio of 5:1 or even 3:1. Talk about precise! Shaomai or shumai in Chinese cuisine is a traditional type of bite-size pork dumpling served as dim sum. They’re living proof that good things definitely come in small packages! They are believed to have originated from the city of Hohhot in Inner Mongolia, but the ones served in the Jiangnan region of Jiangsu, just south of the Yangtze River, are considerably different to their northern counterparts. 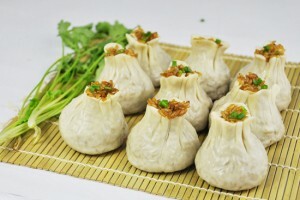 In this variation, the wrapping for the dumpling is much larger and tougher. The filling is made up of glutinous rice and pork pieces that have been marinated in a delectable mixture of Chinese rice wine (Shaoxing wine) and soy sauce. They are normally steamed with pork fat to keep them tantalisingly moist and are markedly larger than other types of shaomai. Most restaurants typically serve them as an appetising accompaniment to a cup of tea. Once you’ve tried these juicy little parcels, you’ll never look at afternoon tea the same way again! These enticingly aromatic noodles originate from Fengqiao Town in Suzhou and are said to have the fragrance of rice wine. So be sure not to breathe in too deeply, or you might end up drunk! The delicate noodles are first boiled before being served in a light broth made from stewed eel bones, river snails, rice wine, and soy sauce. However, the highlight of this dish is considered to be the topping. Thick, streaky slices of pork are marinated in rice wine and stewed for at least four hours before being used as a garnish. The resulting dish is an ideal combination of subtle flavours that melt in the mouth and glance off the tongue. 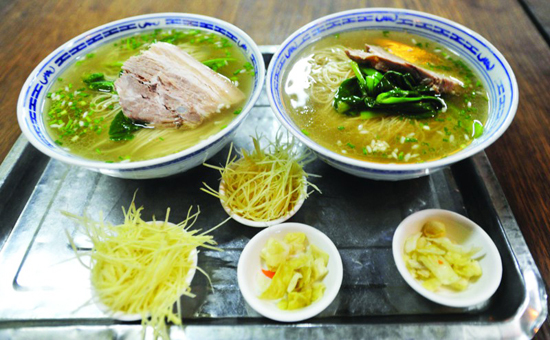 Fengzhen Noodles are typically served during summer, as they are believed to cool the palate during the hotter weather. So if you’re traveling in Jiangsu, be sure to use your noodle and order a bowl of this tasty treat! 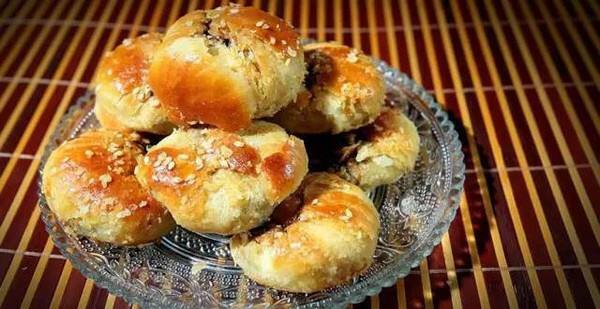 Sesame seed cakes are thought to be the oldest style of cake in Jiangsu and the earliest record of them, written by an agronomist named Jia Sixie, dates all the way back to the Northern Wei Dynasty (386–535). So it seems the locals have had plenty of time to perfect the recipe! Unsurprisingly, this particular type of sesame cake originates from the town of Huangqiao. 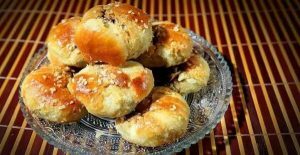 According to local legend, sometime during the Qing Dynasty (1644-1912), the magistrate of Rugao County was visiting the region when he tried a few of these crispy cakes. On returning home, he was so taken with them that he began getting serious cravings. Unfortunately, the counties were over 30 kilometres (19 mi) and it seemed impractical to go all that way just for a snack. So he sent one of his servants to buy the cakes for him instead! The cakes themselves come in a variety of shapes and sizes, from the typical round and oval ones right through to triangular and square ones. 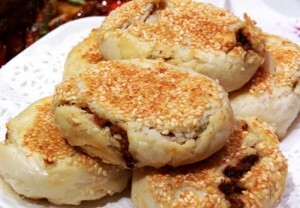 Unlike conventional cakes in the West, Huangqiao sesame cakes come in sweet and savoury varieties. This means the basic dough can vary, as sweet dough incorporates caramel while savoury dough includes pork suet and onion. More sophisticated varieties of this crunchy snack include fillings such as pork, sweet osmanthus paste, crab roe, jujube paste, chicken, and shrimp. So, if you happen to spot a tray full of these fluffy treats, choosing one can feel like a game of roulette!